Poway Unified School District is located just outside of San Diego, California. The district covers 100 square miles and encompasses 38 schools, two district offices, and more than 34,000 students. With the help of a modernization bond measure passed in 2001, the district began planning a major renovation of its buildings, including the installation of classroom AV systems. PoleVault gave us a simple, comprehensive system that was easy for us to install, easy for teachers to use, and easy to support. PUSD Chief Information Technology Officer Robert Gravina says, "We had been installing a bit of AV equipment, mostly projectors mounted in science classrooms. With the bond measure, we wanted to put technology in all our classrooms." Some district officials feared that teachers might be reluctant to use the technology. Gravina believed that teachers would take advantage of it, as long as they "didn't have to be technicians in order to use the equipment." 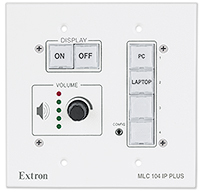 After substantial research, he determined that Extron's PoleVault AV switching and control system was the perfect solution for their classrooms. One of the problems with previous PUSD installations was the lack of an integrated AV system. "We had all these different components," Gravina says, "and everything was kind of all over the place." Mixing and matching AV components from various manufacturers was making maintenance and support difficult for the district, and they were looking for ways to insure teachers' confidence in the technology. The district hired an AV integrator that was a long-time user of Extron products. As Gravina explains, "The integrator brought us to Extron to see their PoleVault System. It had all the components in one comprehensive package, which was important to us." The district decided on PoleVault. "One of the beauties of the Extron PoleVault System is that it's very simple," Gravina says. "A teacher can change inputs, turn the system on and off, and mute the audio, all by just pushing a button." Katie Thompson, who teaches English at Del Norte High School, points out that the PoleVault System is neat and compact. "Before I had PoleVault the cords that connected the LCD projector to my computer were in the middle of the classroom space, my area of teaching, and I would constantly trip," she says. "Now I'm able to 'free-flow' in my classroom, without tripping over cables. It makes my life as a teacher much easier." The district is using Extron GlobalViewer Enterprise Software , or GVE, to manage classroom AV resources over the network. GVE is capable of providing district-wide support for up to 5,000 rooms with room control, scheduling, monitoring, data collection, and reporting. "Support is the most important part of any relationship," Gravina says. "Our teachers rely on the technology and Extron's comprehensive system helps us fix issues quickly." A recent survey showed that 89% of PUSD teachers regularly use their PoleVault Systems. Gravina attributes that partly to the fact that "PoleVault Systems are intuitive and easy to use." Teachers agree. "Having PoleVault in the classroom has aided me in a number of ways," Thompson says. "I'm able to switch between lessons quite quickly; I can adjust for differences in volume between video clips; I can show a video and then switch to a presentation from my computer, all with the push of a button. Not only does the PoleVault System benefit me as a teacher, it definitely benefits the students." Gravina adds, "PoleVault gave us a simple, comprehensive system that was easy for us to install, easy for teachers to use, and easy to support." He concludes that, thanks to PoleVault, "We now have a true multimedia environment." Both teachers and students benefit from the PoleVault System.